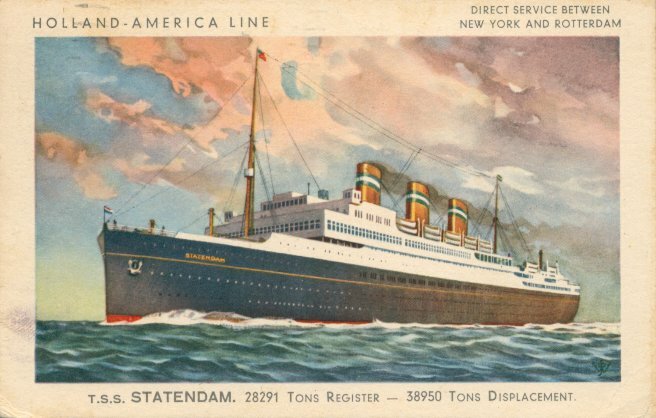 Holland America's third Statendam was laid down at Harland & Wolff, Belfast, in 1921, but the progress of construction soon slowed, as new United States immigration limitations dramatically changed the steerage needs of all North Atlantic carriers. After her launch in September 1924, work stopped completely, she was moored at the yard's Deep Water Wharf and laid idle for more than two years. Finally, in April 1927, after the Dutch government provided HAL with a state loan to finish construction, Statendam was towed to Schiedam, where she was completed by Wilton Fijenoord. On 11 April 1929, after eight years of construction, Statendam made her long-delayed maiden voyage, on Holland America's Rotterdam-New York service. She remained in service for the next ten years, cruising from New York to the Caribbean in the winter from 1930 on. She left Rotterdam on her final North Atlantic crossing on 24 November 1939, and when she returned to the Netherlands she was laid up there due to World War II. Statendam caught fire during the German invasion of the Netherlands on 11 May 1940. According to Bonsor and Haws, she was set afire by the Dutch to prevent the Germans from capturing her or using her as a strong hold. According to Kludas, she was hit by German bombs. According to Kohler she was caught in a crossfire between the two forces. In any event, she was a total loss, and was scrapped in August. Sources: Bonsor's North Atlantic Seaway; Haws' Merchant Fleets; Kohler's The Holland America Line; Moss and Hume's Shipbuilders to the World; Kludas' Great Passenger Ships of the World.